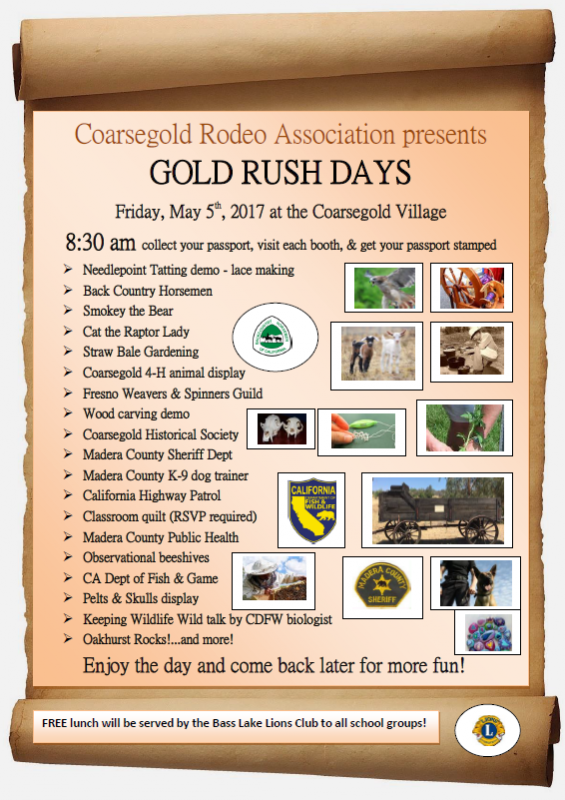 COARSEGOLD — Kids of all ages, prepare to be delighted, as Gold Rush Days comes to the Coarsegold Historical Village on Friday, May 5 for an Education Day with local schools, followed by an entire weekend of festival style fun. 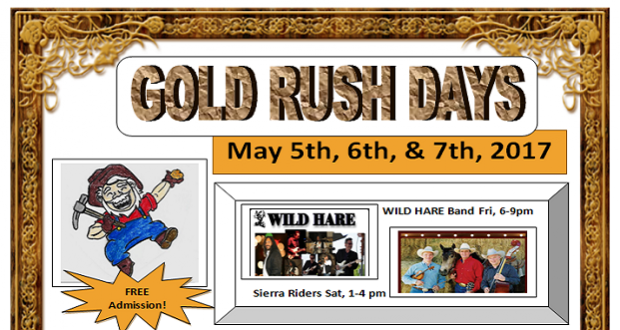 Gold Rush Days is sponsored by the Coarsegold Rodeo Association. The Coarsegold Rodeo Association (CRA) announced earlier this year that they would not produce this year’s Coarsegold Rodeo, traditionally held the first weekend in May. The rodeo will continue that weekend with new leaders at the helm, while the CRA decided instead to put on Gold Rush Days and continue its mission to support local kids in Eastern Madera County. 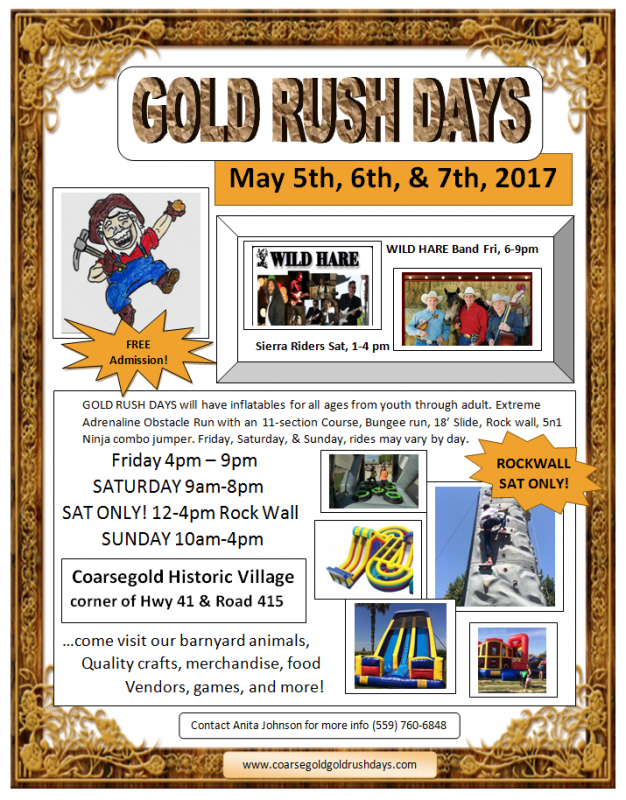 Gold Rush Days will include a Kids’ Education Day for school age children at no charge on Friday, May 5, from 8:30 a.m. to 1:30 p.m. at the Coarsegold Historical Village. Organizers say they have created an engaging outdoor learning environment in which students can explore the natural world. Opportunities include the chance to get up close and personal with bees, thanks to members of the Central Valley Beekeepers Association. Master Falconer Cat Krosschell, aka the Falcon Lady, will be on hand to lead a presentation on Birds of Prey. 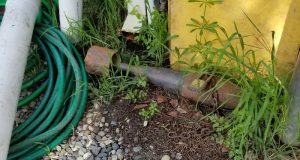 Biologist Ben Lewis from the California Department of Fish and Wildlife will talk to kids about “Keeping Wildlife Wild,” giving them insight on what to do if they encounter local animal neighbors. 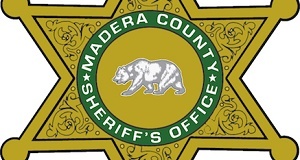 The Madera County Sheriff’s Department K-9 Unit will demonstrate their team at work. Lunch on Friday will be served by the Bass Lake Lions Club. Also participating in Gold Rush Days Education Day are Back Country Horsemen, Fresno Weavers and Spinners Guild and Oakhurst Feed with a straw bale gardening demo. Coarsegold 4-H will have animals on display, and guests at Gold Rush Days will be treated to a demo of tatting, an old-fashioned lace-making technique. Planners also look forward to a wood carving demonstration in which kids may take home a pencil with their name carved in it. Volunteers with Oakhurst Rocks will lead rock-painting, and kids can chat with Smokey Bear along with deputies from the Madera County Sheriff Department, and the CHP. 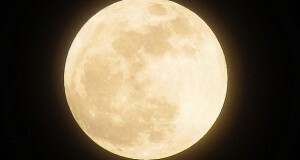 The California Department of Fish and Wildlife will have a display of pelts and skulls, and the Coarsegold 4-H will sell Kids Day Special $1 sno-cones. Classes from schools that pre-register will be able to create quilt squares as a class project. The squares will later be sewn together by a volunteer quilter and delivered to the class within two weeks after the event as a Gold Rush Days memento. All schools are welcome and RSVPs are requested. Students will be given a goody bag which includes a coupon for a 2-for-1 rides wristband for returning to Gold Rush Days when the event re-opens at 4 p.m.
Gold Rush Days will continue after school on Friday with static educational displays all weekend long, live entertainment, vendor and food booths supporting our local schools, clubs, and artisans. Wristbands will be available for sale before the event weekend as fundraisers by local boosters and clubs, or at Gold Rush Days for $10 per day. Vendor booth applications are available and affordable at only $50.00 for the 3-day weekend for this non-profit event. 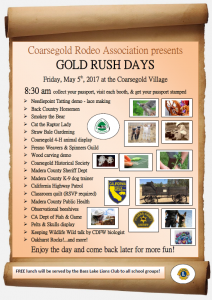 On Saturday, May 6, Gold Rush Days and the Coarsegold Rodeo Association invite the community join together at the Village to honor Patti Law for her contributions to local youth over many years. 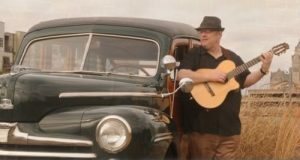 Starting at 10 a.m., organizers suggest that visitors bring lawn chairs or blankets and plan to enjoy, as the Patti Law School of Dance gives an unforgettable performance. The community is invited to share their favorite memories of Miss Patti and the CRA will provide a memory book for the public to sign. The organization is crafting a together “Scrapbook Through the Decades” for Miss Patti. If you have pictures of yourself, your children or your grandchildren that you would like included, please bring that with you and write your name, and year that you were in her class on the back. While parents shop and enjoy the free concerts Friday and Saturday, the fun continues all weekend long for kids of all ages with an Extreme Inflatable 11-piece obstacle course and bungee runs. 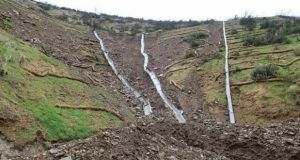 There will be a Rock Wall to challenge the climbers on Saturday, as well. The Logger’s Jamboree Queen’s Contestants will be present at Gold Rush Days, selling tickets to the 58th Annual Loggers Jamboree. The CRA’s Disneyland raffle is also underway, with only 200 tickets being sold, say organizers, giving buyers a 1:200 chance of winning four 1-day hopper tickets to Disneyland in Anaheim, CA. Raffle tickets are $10 each. 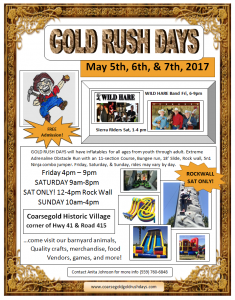 For more information, contact Coarsegold Gold Rush Days on Facebook, or visit the website at www.coarsegoldgoldrushdays.com. Citizens on Patrol(COP), Cal-Fire, USFS Bass Lake Ranger Station and Ecologist Theresa Lowe, Coarsegold Chamber of Commerce, Sierra Telephone, Coarsegold Mountain Feed, Fresno Flats, Madera County Farm Bureau.